Heat a soup pot over medium-high heat with olive oil. Add fennel and sauté few minutes to soften; add asparagus, leeks, garlic, salt and pepper, and cook a few minutes more, partially covered. Add peas, favas and stock, and simmer to heat through. Purée half of the soup and return it back to the pot. Heat a cast-iron pan or griddle over medium to medium-high heat. Butter one side of the sliced bread. Combine the Dijon and crème fraiche and spread it on the opposite side of 4 of the slices of bread, arrange the cornichons in the Dijon cream. Top the Dijon with Gruyère or Swiss and a few slices of ham, top ham with sliced brie or camembert and finish with another slice of bread, buttered side facing out. Grill cheese and ham until deeply golden and cheese melted. Add lemon juice to soup. Serve in bowls topped with herbs. Cut sandwiches in half and serve alongside. In Recipes-list.com we have selected the most viewed recipes from category - uncategorized . Enjoy the best recipes specially selected for you! 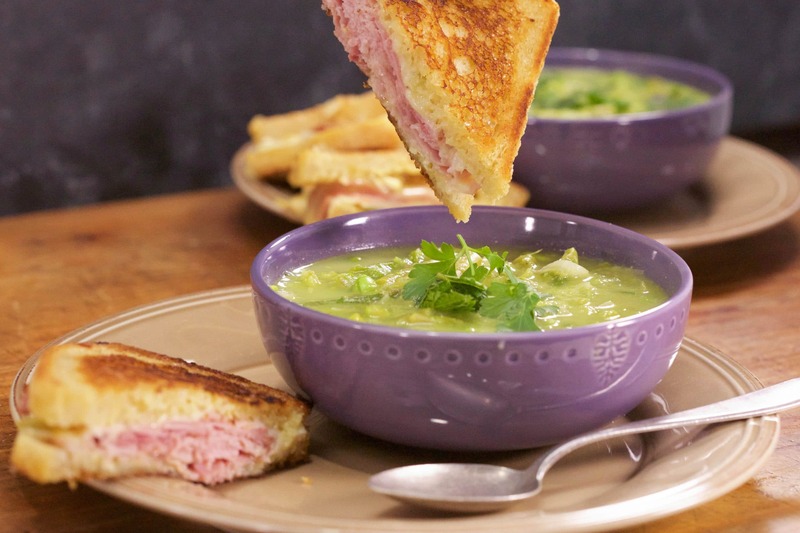 Asparagus and Pea Spring Soup With Grilled Ham ‘N Cheese is the right choice that will satisfy all your claims.